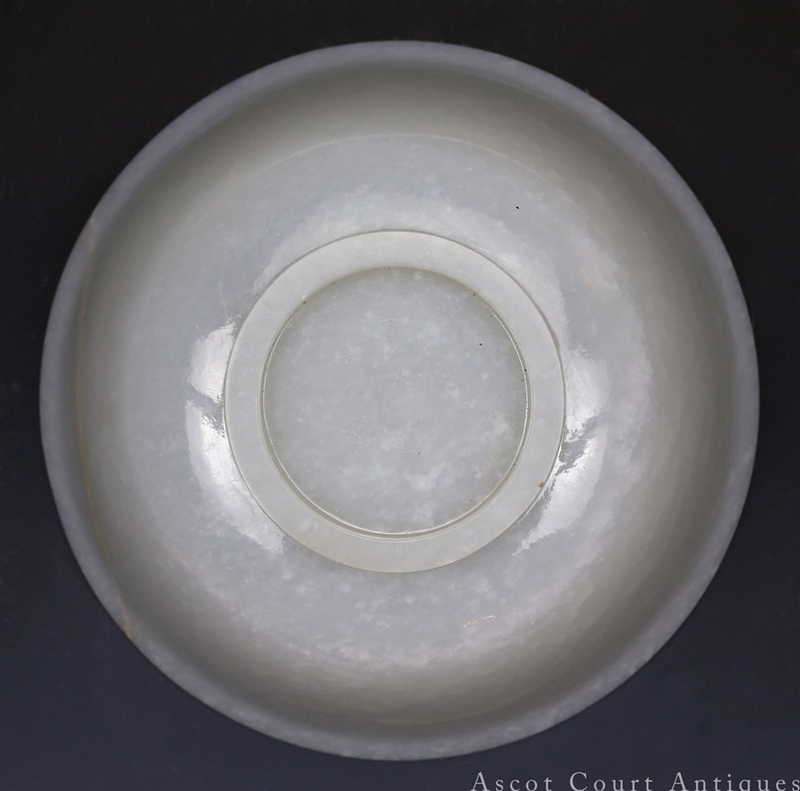 A very fine mid – Qing mutton fat Khotan / Hetian white jade bowl of excellent translucency and luster. 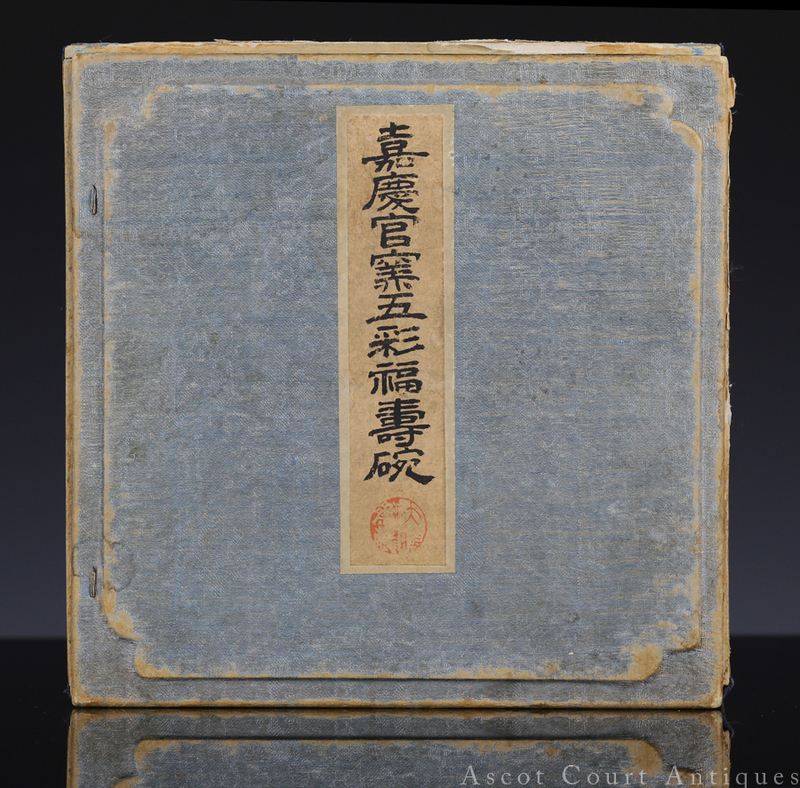 The bowl comes well-fitted with an old box bearing imperial labels for a Jiaqing official-kiln wucai bowl, suggesting that this bowl once belonged to the imperial collection, and was matched with a fitting box at the imperial storehouses. Chinese royal houses have used jade vessels since the Han dynasty. 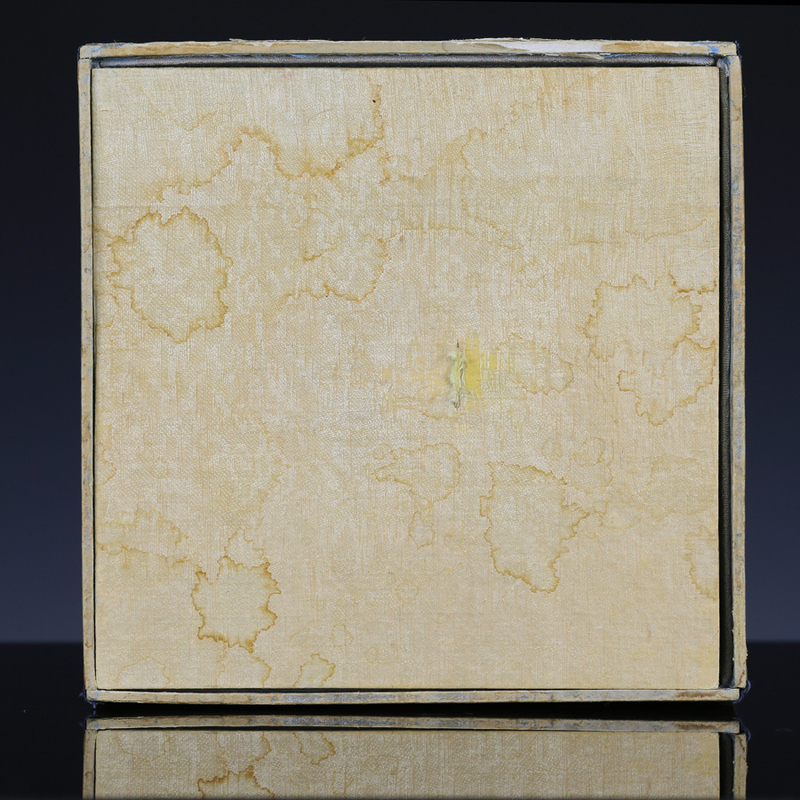 According to legend, the emperor Han Wudi (r. 140-87) believed he could attain immortality by drinking dew mixed with ground jade. 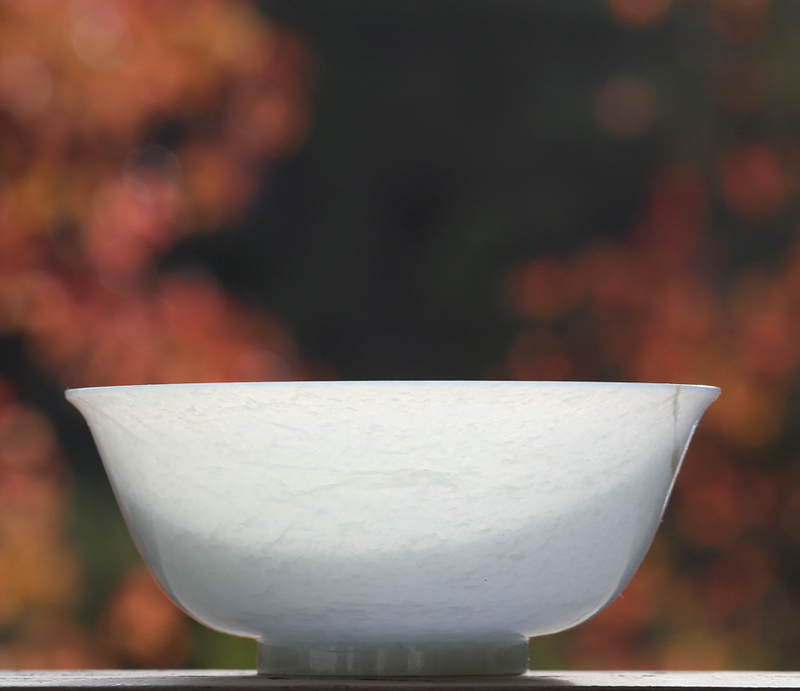 The Daoist cult of immortality has traditionally placed great value in jade, and jade vessels were thus made for ritual purposes rather than for everyday use. 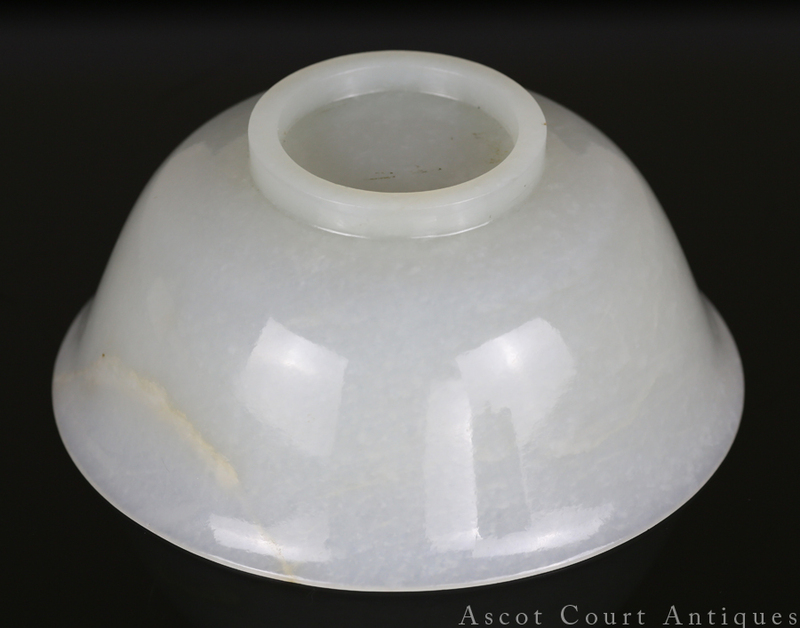 The preciousness of Hetian jade meant that jade food and wine vessels were used on special occasions only, and symbolized affluence and privilege for those who could afford them. 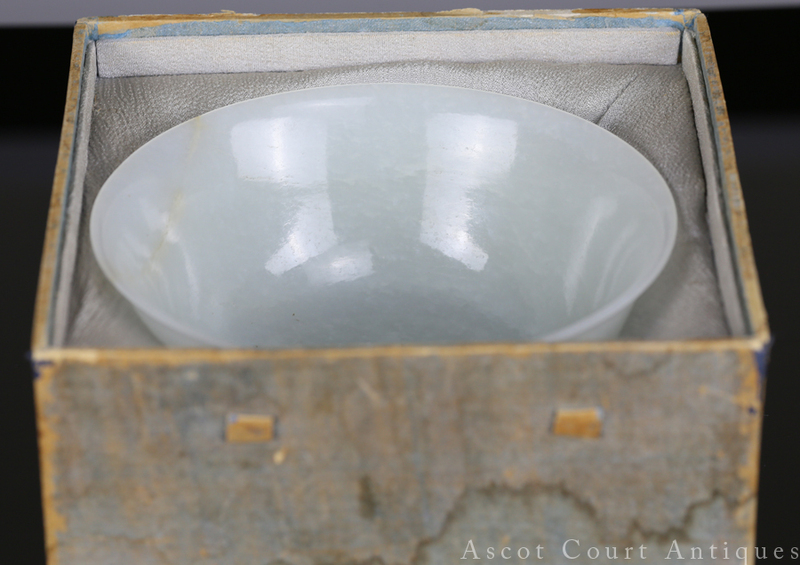 Crafting a jade bowl was a time consuming and wasteful process that involved taking a large jade boulder and hollowing out the center. 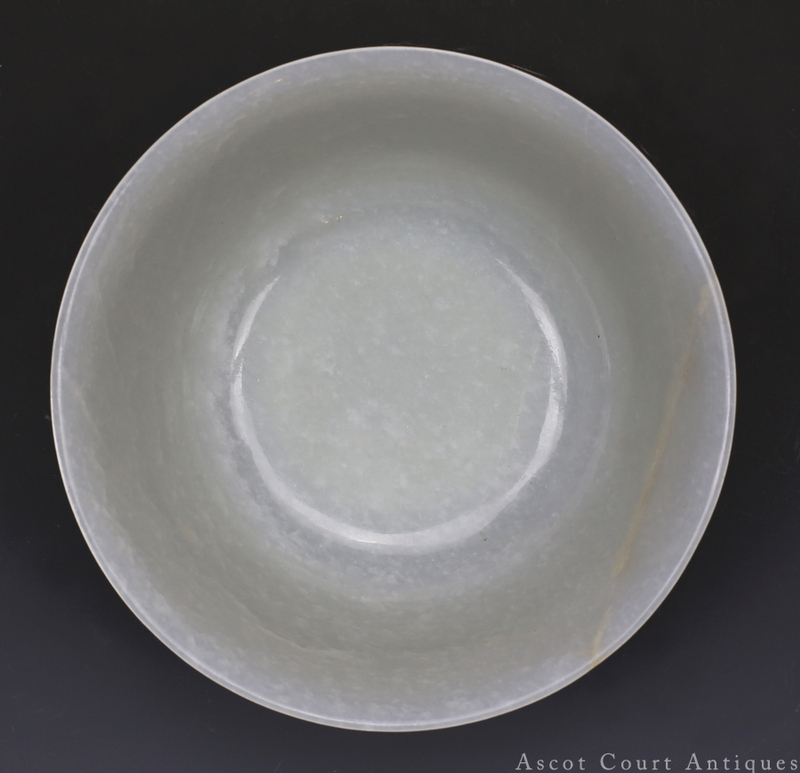 Due to its material requirements, jade bowls were rare until the 18th century, when the supply of Hetian jade rose as a result of it being quarried from the mountains rather than the riverbeds as previously practiced. 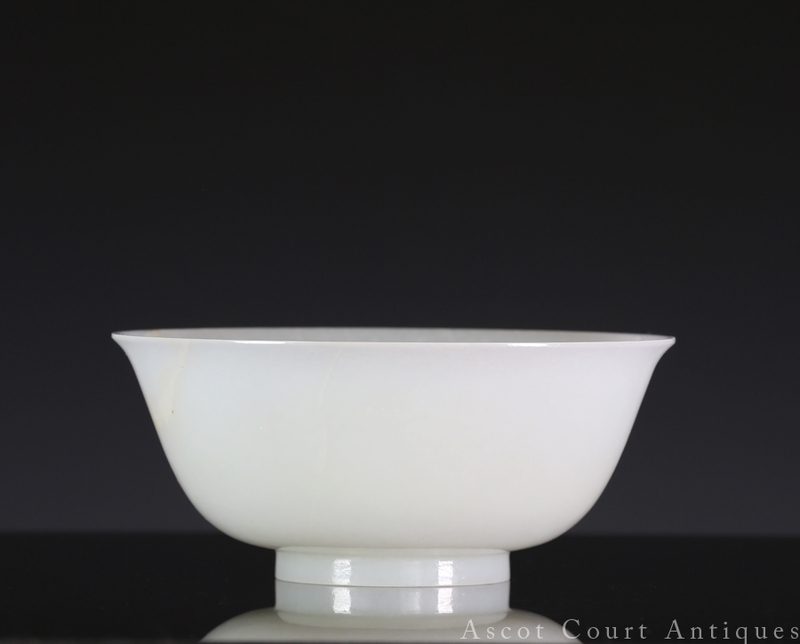 With its everted rim and straight foot-rim, this jade bowl closely mirrors fine porcelain bowls made for the Qing court. 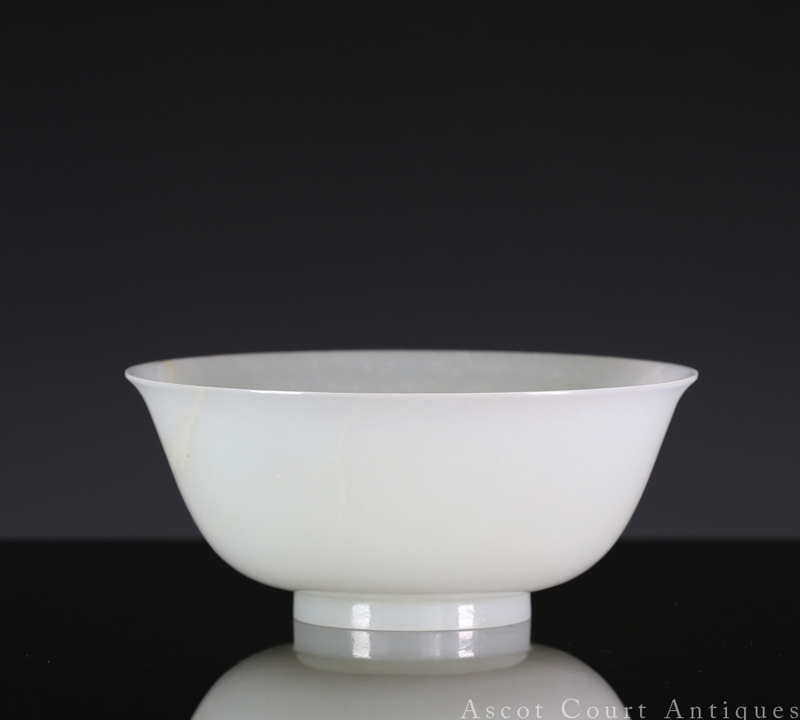 It is also similar to other imperial white jade bowls from the Qianlong and Jiaqing periods. 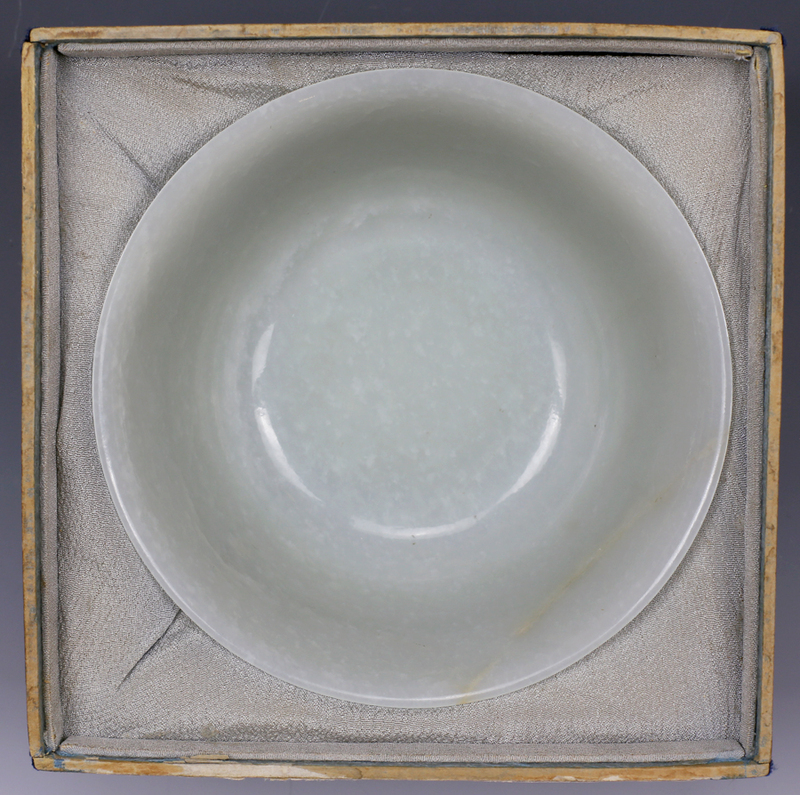 There is a similar white jade bowl, dated Jiaqing, in the Beijing Capital Museum. 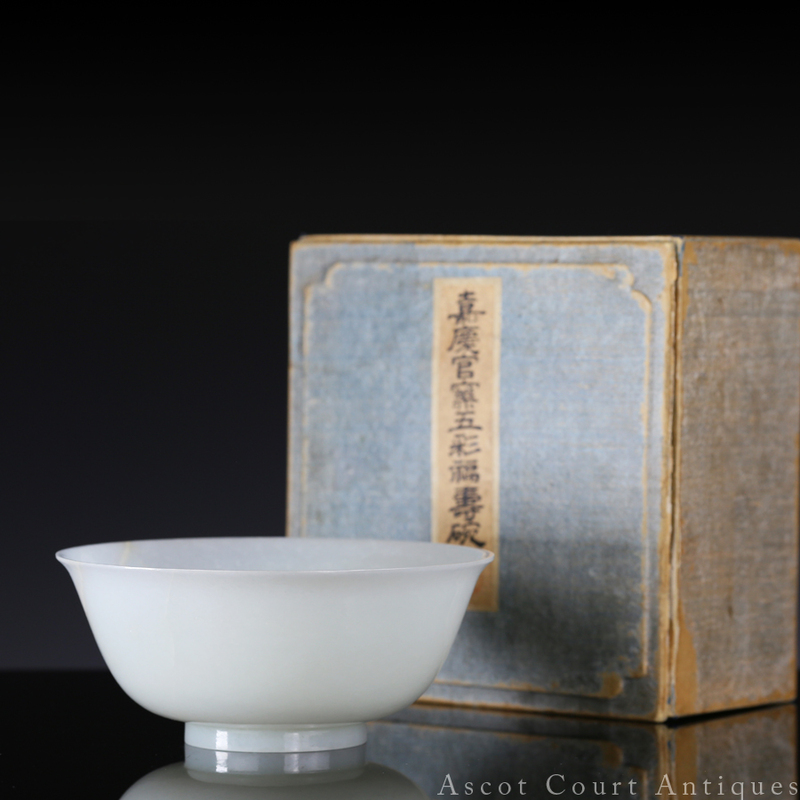 Another bowl, dated Qianlong, sold at Christie’s London (lot 96 sale 7997). 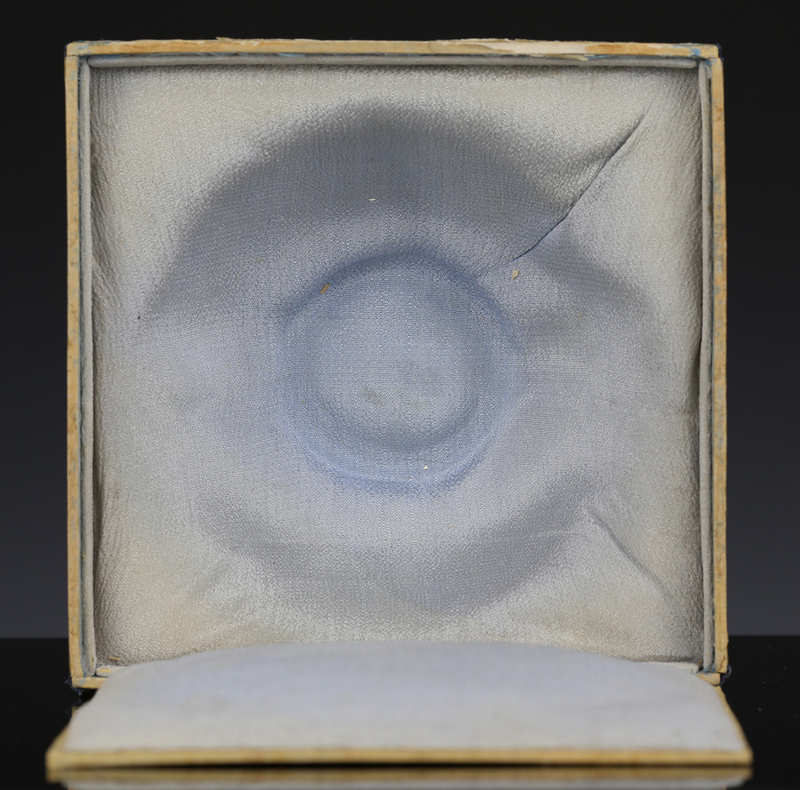 A lightly larger bowl sold at Christie’s Hong Kong (lot 2967 sale 2891).